This tutorial will show you step by step how to create a system image backup in Windows 7, 8, or 10. And also how to create a recovery disc and restore a system image. What is a system image backup? A system image is a backup that contains a copy of your Microsoft Windows with all of your installed programs, system settings, and files. You can use a system image to restore Windows and software when your PC or hard disk stops working, or when your computer is infected by malware (computer virus, spyware, adware, rootkits, trojan horse, worms, etc..) that is difficult to remove or when Windows is not working properly anymore. You can store the system image on a second internal hard drive (installed in your computer), an external hard drive, USB flash drive, on one or more DVD(s) or on a network location. I will show you step by step how to create a system image, how to create a recovery disc, and how to restore a system image in Windows 7, 8, 8.1 and 10. 1. Click on the start menu button, go to Getting Started and choose Back up your files. 2. Click on Create a system image at the top left. 3. Select where you want to save the backup. If you selected On a hard disk, then connect your external hard drive now. If it doesn't appear, then click on Refresh. If you selected On one or more DVDs, then insert the first blank DVD into the DVD burner drive of your PC. If you selected On a network location, then click on Select, enter the location, username, and password, and click on OK.
5. Click on Next (located at the bottom). 6. Click on Start Backup. Windows will now create your system image backup. This may take a while. The time it will take depends on your system and which method you use to save the backup. Windows will give you the option to create a system repair disc. A system repair disc can be used to boot your system. It also contains Windows system recovery tools that can help you recover Windows from a serious error or restore your computer from a system image. You can also use the Windows installation disc or USB flash drive to recover or repair Windows. To create a system repair disc, just select a CD/DVD drive, insert a blank CD or DVD into the drive and then click on Create disc. 1. Open Windows Control Panel. Enter control panel in the Windows search bar and click on it when it appears. Click on the Windows start menu button, click on Windows System and then click on Control Panel. Press the [Windows] + [Pause] key on your keyboard and then click on Control Panel Home (top left). Press the [Windows] + [R] key on your keyboard to open the small Run window, enter control panel and then click on OK or press Enter. Right-click on the Windows start menu button and then click on Control Panel. 2. Click on System and Security. 3. Click on File History. 4. Click on System Image Backup located at the bottom left. 5. Click on Create a system image located at the top left. 6. Select where you want to save the backup. 8. Click on Next (located at the bottom). 9. Click on Start Backup. Warning! You should backup all your data (documents, videos, movies, music, and other files) before you restore a system image backup, otherwise, you can lose your data. 1. Connect the external hard drive (containing the system image) to your PC. 2. Press and hold the [Shift] key on your keyboard. 3. Click on the start menu button. 4. Click on the power button. 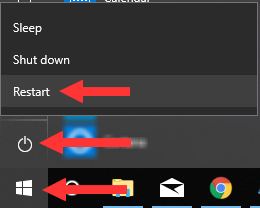 Note: If the start menu button is not working, then you must open Settings, click on Update & Security, click on Recovery and then click on the Restart now button. 8. Click on System Image Recovery. 9. If Windows asks you to select an operating system, then do it. Windows will now search for a system image on your external hard drive. 10. Select the system image and click on Next. The system restore process will now start. This may take a while. Windows will restart your PC when it's finished. 1. Insert the recovery disc into the CD/DVD drive of your PC. 2. Connect the external hard disk (containing the system image) to your computer. 4. Boot from the recovery disc. If the Bios of your system is set to boot from a CD/DVD or USB drive, you will see Press any key to boot from DVD (or USB). If you don't get this message, then you will need to press the correct keyboard key to open the boot menu. Common keyboard keys to open the boot menu are F9 on HP, F10 on Sony, F11 on MSI, F12 on Dell, Lenovo and Acer, and Esc on ASUS. 5. Press within 5 seconds on any key to boot from a CD or DVD. Windows will now load the necessary files from the disc and after that, it will open a System Recovery Options window. 6. Select the right keyboard input (when asked for) and click on Next. System Recovery will now search for the system image on your hard drive. 7. Select Restore your computer using a system image you created earlier and then click on Next. 8. Select Use the latest available system image (recommended) and then click on Next. 9. At the Choose additional restore options screen, you click on Next. 10. Make sure that it's the correct system image and click on Finish. 11. When the warning message appears, you click on Yes. The restore process will now start. This may take a while. Windows will restart your PC when it's finished.